For years I've picked rum, tequila and gin over whiskeys or vodka, and my cocktail picks reflect my personal preferences. But since sampling a 1794 cocktail a few weeks ago, I've suddenly found myself thinking about rye! 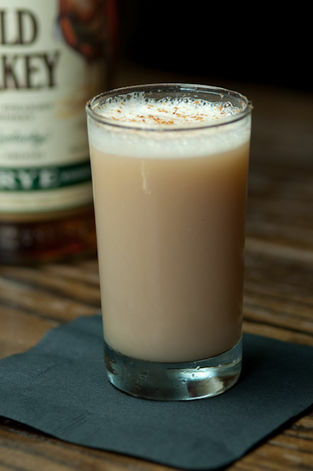 Combine whiskey, lemon juice, maple syrup, egg white and bitters in a shaker; shake vigorously for 10 seconds, then add ice and shake for 30-40 seconds. Strain into a chilled glass, then top with soda and garnish with cinnamon. Notes: A touch of maple syrup adds a wintery sweetness to this cocktail–search for grade B syrup, with a darker, richer flavor than grade A drizzle. And of course, you can always skip the egg white if it makes you anxious, but it adds a divine texture–cheers! Cocktail by Erick Castro, Rickhouse. Mmm! I'm a HUGE fan of rye... this cocktail looks delicious! Ohhh I might have to make that for the birthday boy!!! Our Aunt & Uncle have been tapping our trees to make maple syrup!! Happy weekend Lovely Lena! Oooh I've never tried rye in a drink...must give it a shot. Thanks for the recipe Lena. Rye whiskey is probably my favorite. It reminds me of my (irish/scottish/english) grandfather. He used to drink it with ginger ale. Yum! We want to try this, for sure! We are off to a maple syrup festival tomorrow and this will be the perfect libation to greet us as we arrive home!! Hope you have a wonderful weekend my friend! I am definitely making this for my husband's bday this week! It sounds right up his alley. Hmm...the maple syrup and cinnamon intrigue me. When you have friends over...does John whip up a different drink for everyone? or does he ask them to pick their alcohol then mixes accordingly?